A paper HERE on the complex history of how the domestic apple developed along the `silk road' trading routes. Human selection has reshaped crop genomes. Here we report an apple genome variation map generated through genome sequencing of 117 diverse accessions. 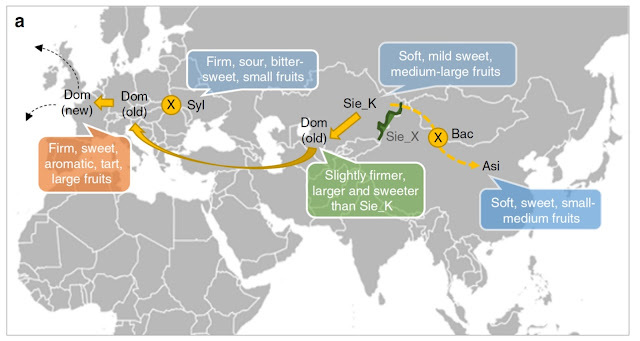 A comprehensive model of apple speciation and domestication along the Silk Road is proposed based on evidence from diverse genomic analyses. Cultivated apples likely originate from Malus sieversii in Kazakhstan, followed by intensive introgressions from M. sylvestris. M. sieversii in Xinjiang of China turns out to be an “ancient” isolated ecotype not directly contributing to apple domestication. We have identified selective sweeps underlying quantitative trait loci/genes of important fruit quality traits including fruit texture and flavor, and provide evidences supporting a model of apple fruit size evolution comprising two major events with one occurring prior to domestication and the other during domestication. This study outlines the genetic basis of apple domestication and evolution, and provides valuable information for facilitating marker-assisted breeding and apple improvement.